There is nothing quite like a great beach day with family and friends. But, for people with diabetes, it may not be as simple as grabbing a towel and picking up a sandwich or bagel on the way. Having diabetes doesn't mean you can't go to the beach, but you probably will have to do some extra planning. How will you keep your diabetes supplies cool? What will you wear on your feet to protect them from the hot sand? And the most common question asked: What will you eat? One of the most convenient foods for the beach is a sandwich. Its portable, easy to keep cool and easy to eat. If you have diabetes, you may have heard that bread is the enemy and sandwiches are forbidden. This is not true. While bread is mostly carbohydrates, people with diabetes do not have to avoid carbohydrates altogether. Rather, eating a modified carbohydrate diet that is rich in fiber can help people with diabetes reach blood sugar and weight goals. Two slices of bread typically contains about 30 grams of carbohydrates, which is an acceptable amount of carbohydrates for lunch. Instead of purchasing a sandwich that is overpriced and overstuffed, save yourself on calories, carbohydrates, and money by packing your own. The key to creating a healthy sandwich is all in the construction. Choose the right bread and ingredients in between and you'll have a nutritious, fiber and protein packed lunch. Follow these tips and your companions may want to eat your sandwich instead of their own. Choosing a healthy bread can be a very confusing task. With hundreds of options, being a savvy consumer who understands labels will be very important. Before scouring the aisles, save yourself some time by avoiding all white breads. Skip the bagels, rolls, and other white breads with the first ingredient listed "enriched wheat flour." Enriched wheat flour is simply white bread that has had vitamins and minerals added back in that were stripped during processing. Also, don't be fooled by breads labeled 7-grain, multi-grain, or 9-grain. Most of these breads are simply white flour based breads that contain multiple grains. All of these bread types are lacking in fiber and are likely to spike blood sugars more rapidly than a whole grain bread. When choosing a bread, it's important to always look a the ingredient list. You can identify a whole grain if the first ingredient says "whole." Or, you can look for the 100% whole grain stamp. A good bread will be a whole grain that contains at least 3 g of fiber and about 15 g of carbohydrate per slice. Keep your serving to 2 slices, or 1 whole grain English muffin, wrap, sandwich thin, or pita. Your protein choice will be the base of your sandwich — keep it lean. Avoid high fat cold-cuts such as bologna, salami, or cheese and instead opt for low-sodium ham, turkey or roast beef. Ask for thin sliced cold-cuts and limit your portion to about 3 to 4 ounces (if sliced thin this is about 5 to 6 slices, if sliced larger, about 3 to 4 slices). If you are following a sodium-restricted diet, you may want to avoid cold-cuts. Instead cut up leftover grilled chicken, turkey, pork or other lean protein from last nights dinner. Lastly, if you are not into any of these types of protein, try tuna (packed in water) or egg whites. Adding volume to your sandwich will help to keep you full and boost your nutrient intake. Bulk up your sandwich to complete your meal by adding non-starchy vegetables. Add chopped celery, carrots, or onion into your tuna, egg, or egg white salad or place lettuce, tomato, roasted, or cherry peppers or another vegetable of choice on top of protein to add crunch, color and flavor. Don't be afraid to throw in any leftover vegetables. Getting creative will make your sandwich more appealing and tasty. Avoid high-fat condiments such as mayonnaise, butter, cream cheese, and creamy dressings to save on calories and saturated fat. Instead, simply top your sandwich with a dollop of mustard. Or, smear your bread with hummus or avocado for additional heart-healthy, monounsaturated fat. You can also make tuna or egg salad with avocado or hummus as opposed to mayonnaise. Remember to stick to a serving size, about 2 tablespoons or 1/3 avocado. 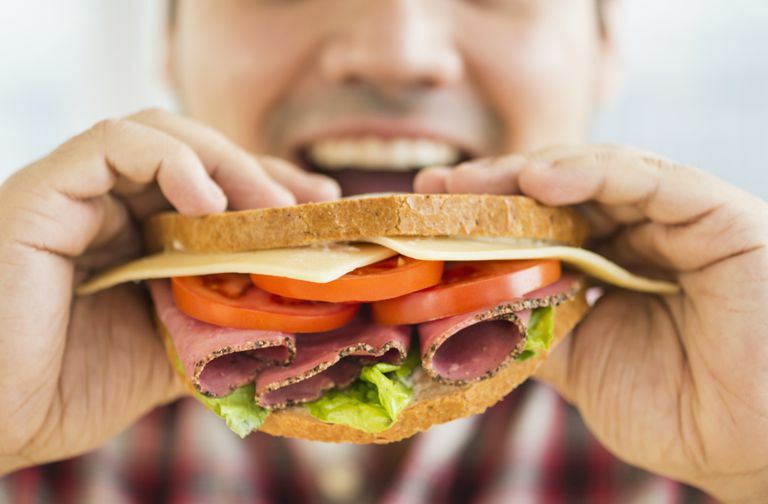 Can a Healthy Diabetic Diet Include Sandwiches?